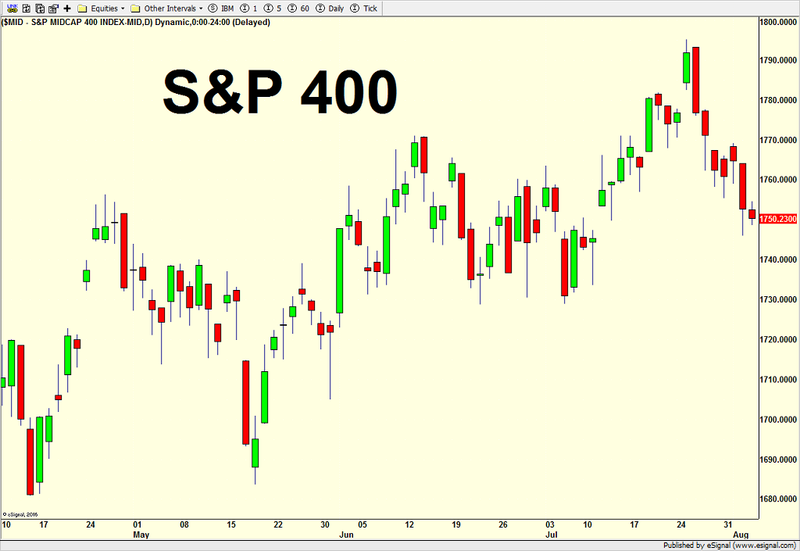 While the short-term pullback continues, stocks are seesawing back and forth and are “supposed” to bounce here. For the past two trading days, the bears were unable to follow through from Thursday’s decline and fought the bulls to a draw. Unless we are looking at something bigger on the downside than I expect, we should see the bulls step up in a small way. 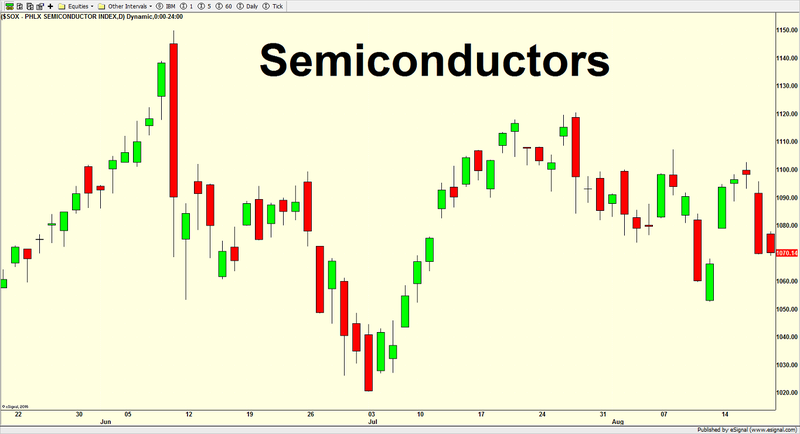 It will be interesting and perhaps telling to see which of the major indices lead and lag the bounce. 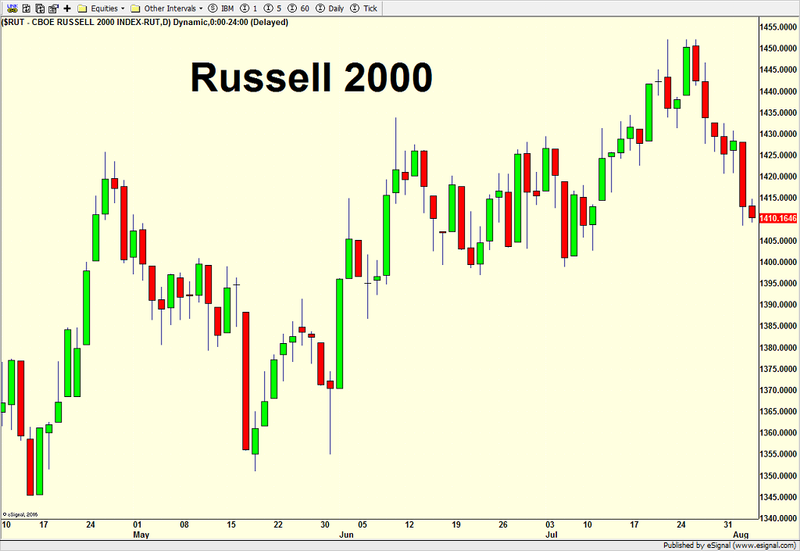 Both the S&P 400 and Russell 2000 are still in the doghouse. On the sector front, it’s an uglier story with only the semis remotely hanging in. 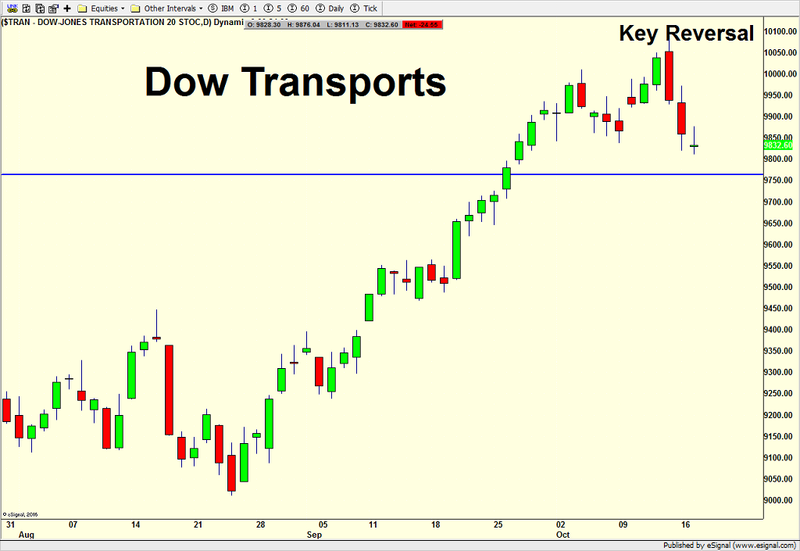 Banks and transports are already breaking down and discretionary isn’t too far behind. Only utilities look strong here and that’s not what should be leading if the rally were on solid ground. Should the semis lose it, I would think the overall stock market decline to quickly resume to its next downside level, roughly 3% lower. 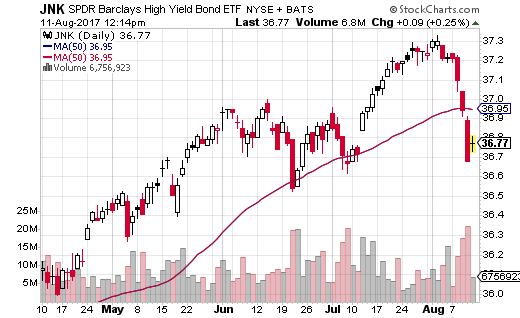 Looking at my favorite canary in the coal mine, high yield bonds are trying to make a higher high, however I do not believe it’s going to hold. Momentum on down days just overwhelms up days and the intermediate-term pattern isn’t inspiring confidence. There are more than a few cracks in the pavement which need to be repaired before the next rally begins. I would use little bounces to reposition portfolios. I would not chase stocks higher. All month I have been writing about a short-term pullback for stocks. Nothing huge. Just your garden variety 3-5% bout of weakness which could overshoot. This coming from someone who has been bullish all year on stocks. I won’t reanalyze what I have already written several times, but here are a few reasons. 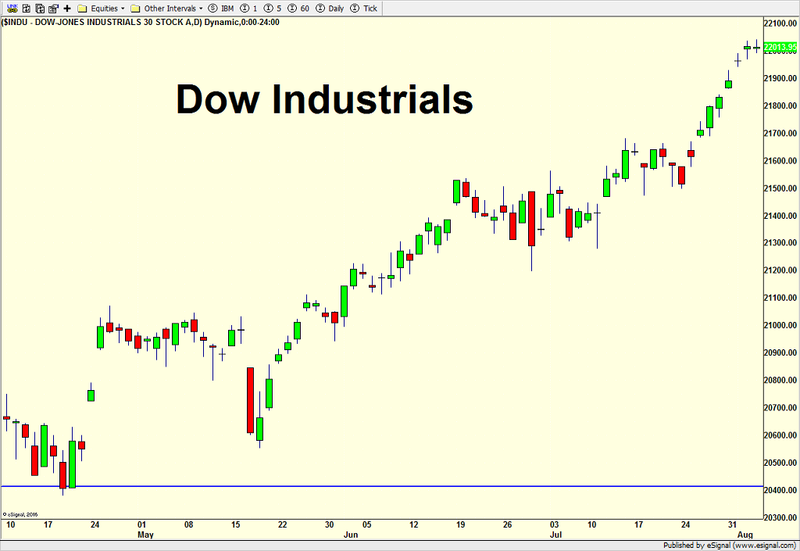 The Dow Industrials were off on their own island of strength while the mid and small caps were in decline. 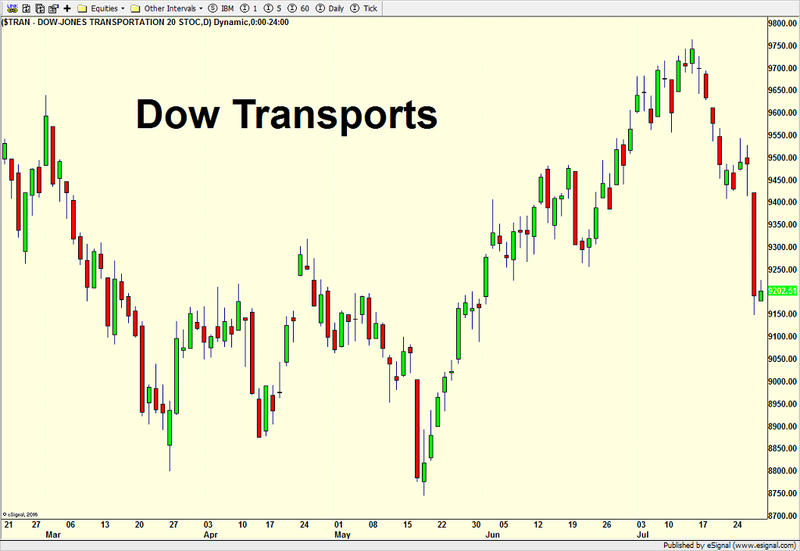 Dow Transports were even weaker. Sentiment surveys and option data had become too greedy, too complacent and too positive. The list of stocks making new 52 week lows expanded and then surpassed those making 52 week highs, all while the major indices were so close to all-time highs. Key sector leadership fell off. The stock market was just looking for a catalyst or an excuse to pull back. First it was North Korea and then it was Charlottesville and now it’s Barcelona and Gary Cohn. The common thread in each case is President Trump. Since the post-election rally, dubbed the “Trump Rally”, “Trump Jump” and “Trump Bump”, I have remained firm that while the president always gets credit and blame, the rally was really based on the GOP’s election sweep and perceived ability to govern and pass legislation as they saw fit. That agenda is now being questioned and you will likely start hearing the media and pundits refer to the pullback as the “Trump Slump” or “Trump Dump”. You don’t read this blog to hear my social views so I am not going to a rant about what’s going on in the country today. Suffice it to say that for as long as I can remember back to my childhood, I have always fought and stood against racism, bigotry, intolerance, discrimination, hatred and evil. They have no place in this country or on earth. There are no exceptions to this. At the same time, free speech is one of those inalienable rights which we often take for granted. However, it’s not really 100% free speech as you can’t scream “fire” in a crowded theater. There are limitations. Those a lot smarter than me will likely be struggling with this over the coming years if the 9-year escalation of racism, bigotry, hatred, white supremacy & neo-nazism continues. That was more than I wanted to write, but it wasn’t quite a rant. Anyway, back to the markets and what’s at hand. The pullback is continuing as planned with Thursday being the first across the board rout where basically everything went down. For those looking for a silver lining, the defensive groups like staples, utilities and REITs were hit along with the others. That typically confirms the decline and indicates more downside before a low, but it’s getting there. It’s a necessary piece towards an eventual market bottom. On the positive side, while high yield bonds have declined, their weakness has been small although I sense more downside is coming. The semis which I wrote negatively about here have been the quiet winners during the pullback and are the lone holdout from making new lows. It will be very interesting and telling to see if they can hold up. With all of the major indices in gear to the downside, it’s unlikely that the current action is just a re-test of the North Korea decline from last year. Momentum is making a fresh low now so we are likely to see at least a low, a rally and a new low before the whole decline wraps up. I had written about a rocky period into mid-September and I am not ready to change that opinion just yet. Let’s see what shakes here. Don’t forget that the Fed has their annual retreat next week in Jackson Hole WY. With Janet Yellen and Mario Draghi (ECB) both in attendance, we should expect to hear more about their respective balance sheets. In part II of the piece I started last Friday, I turn to the market evidence supporting the 3-5% pullback I have been discussing all month. While tensions with North Korea have quieted down over the weekend and global stocks are sharply higher, I do not believe the pullback is over. Now, if the five major indices scream right back to new highs and sector leadership is strong, I will clearly be wrong in this call, but I am willing to give it some time. Let’s see if the bulls can first retrace what they lost last Thursday. 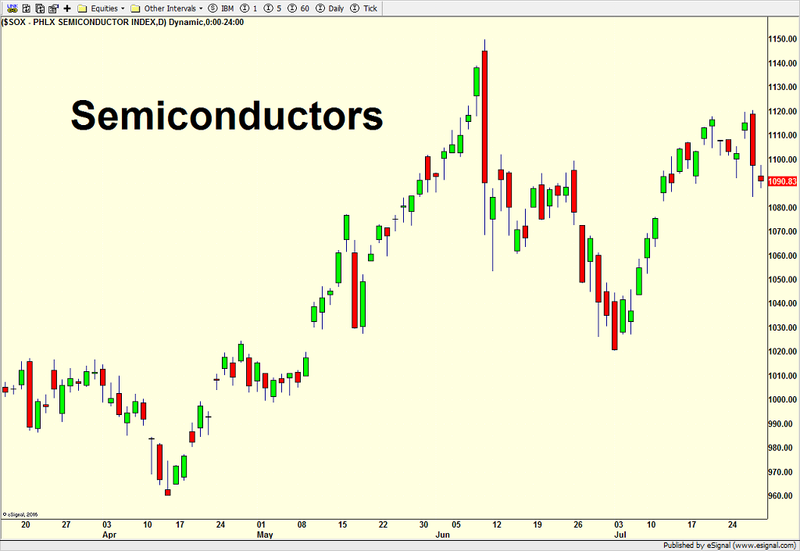 One of the many reasons I started looking for a pullback can be seen in the charts below. Just take a cursory glance and you will see that the Dow Industrials are leading the parade with the S&P 500 just behind. 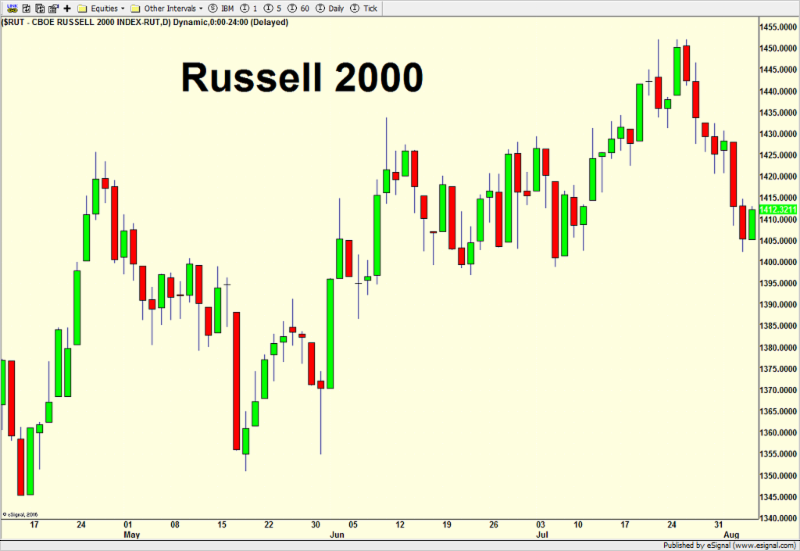 The S&P 400 and Russell 2000 are lagging significantly. 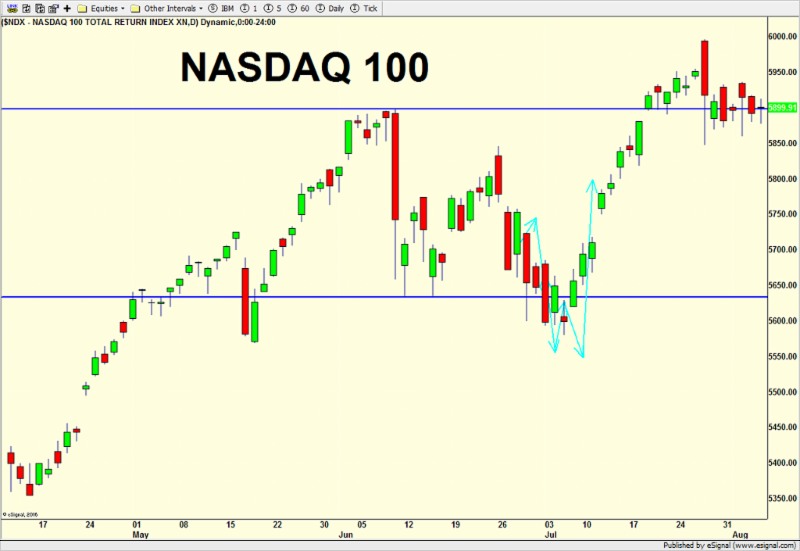 The NASDAQ 100 is just a tad better. 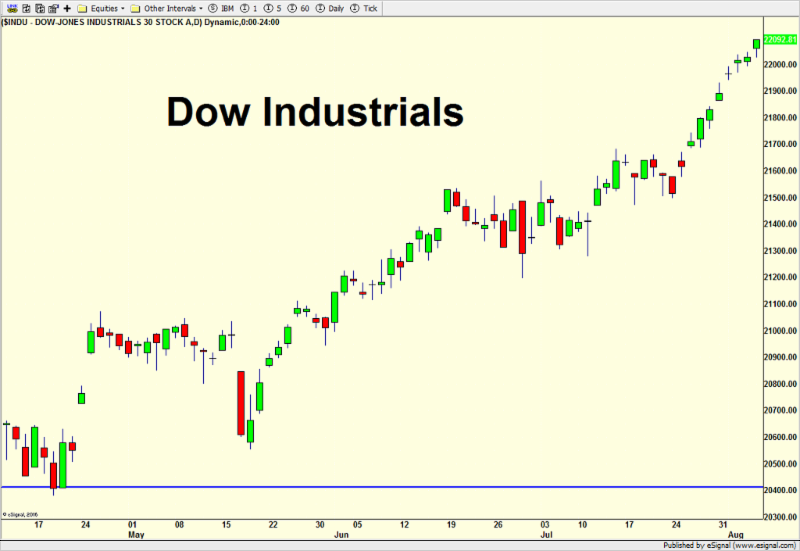 Leadership by the Dow does not equate to healthy and strong leadership. It’s exact opposite. Investors are looking to hide in the “safer” and more liquid areas. If this was one of my regular Canaries in the Coal Mine update, I would offer that none have died or are close to dying, but a few are coughing. Stock market sentiment began to get a little too happy, complacent, greedy or whatever other adjective you want to use. We saw it in the surveys, the options data as well as the Rydex fund flows. While sentiment ebbs and flows at a good pace, weakness is likely needed to restore at least a small wall of worry. 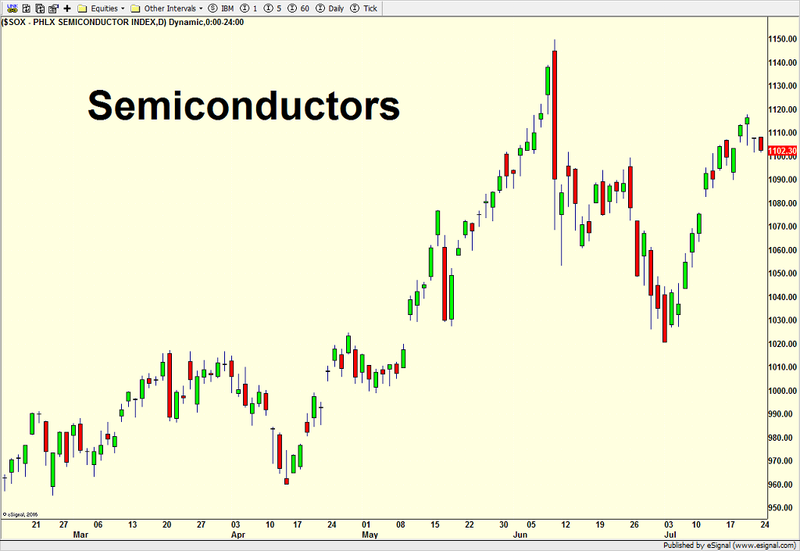 The semiconductors are one of my favorite sector canaries and concern over the past few weeks has been that with the NASDAQ 100, software and internet sectors all scoring fresh new highs, the semis have been unable to. If they started to rollover, they would likely bring down the rest of the tech sector with them. 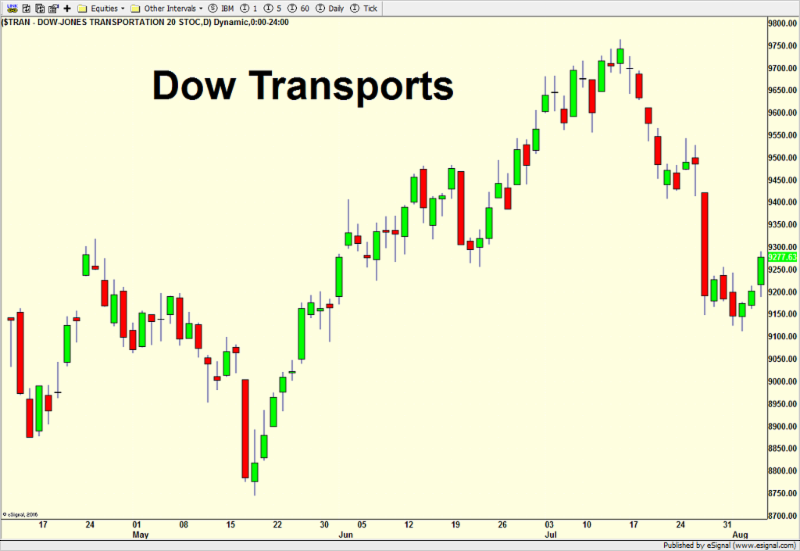 The Dow Transports are another sector which had been under pressure long before North Korea became a recent issue. You can see below its decline was more than just a few day event and warrants attention. Until earlier this week, I was holding out hope for the bulls by the continued strength in the high yield bond sector, my favorite canary in the coal mine. However, the past three days have seen relentless selling in this sector. Something has changed in the character of the market. I could add to my list of short-term concerns including the infamous Hinderburg warning which really just says the market is very split with an equal number of stocks doing well as poorly. 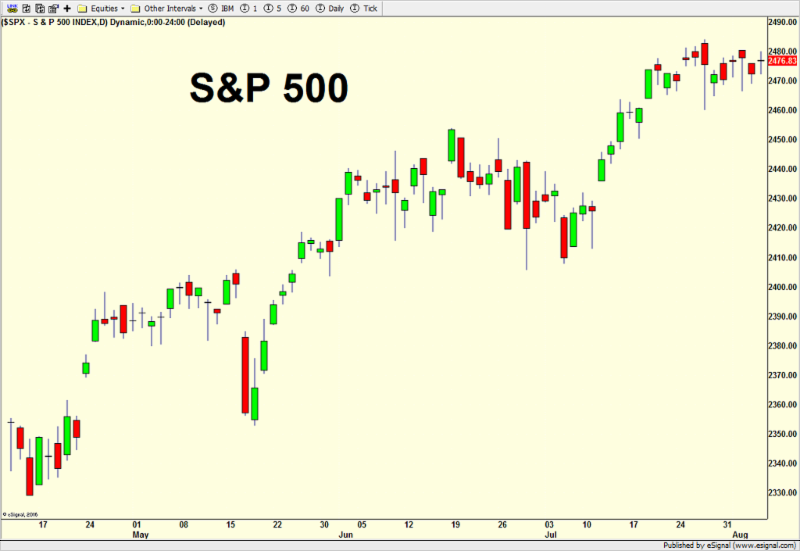 The number of stocks making new highs and new lows has shifted significantly to the negative over the past week adding credence to the Hinderburg. 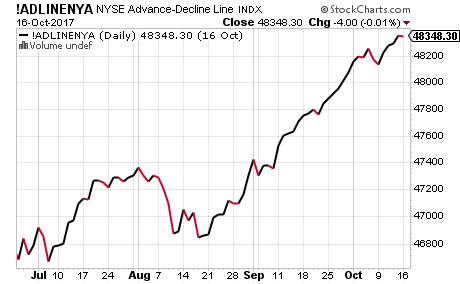 HOWEVER (isn’t there always), the New York Stock Exchange Advance/Decline Line, which measures market participation just hit an all-time high earlier this month. Historically, that pretty much insulates stocks from a serious decline or bear market as it shows good health and lots of liquidity. 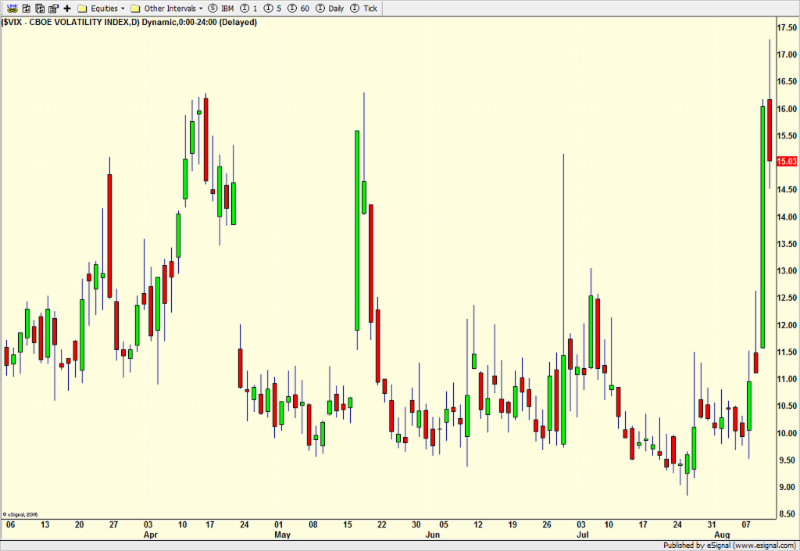 Finally, the much talked about VIX which is a broken measure of anticipated volatility spiked by almost 50% this week and almost 100% from its recent low. 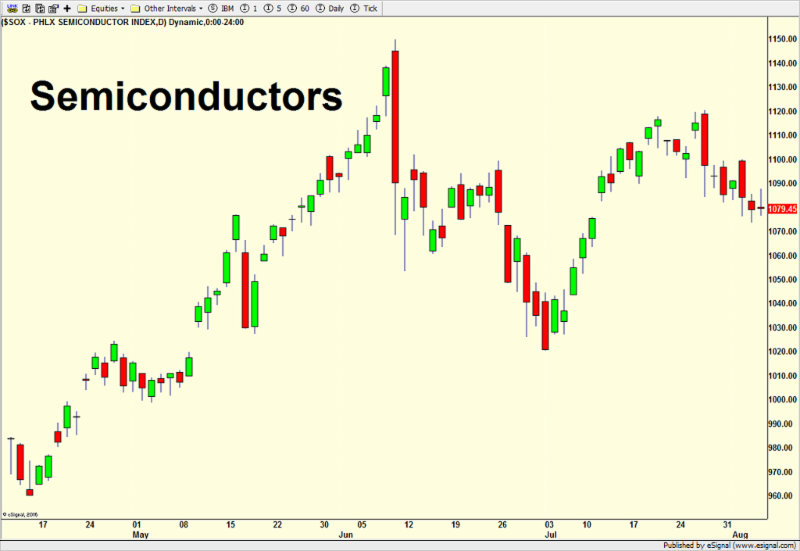 That has been a strong indication of future gains several months out. In short, the next few weeks to month or so could be rocky, but not cataclysmic. Besides North Korea, we have the single biggest geopolitical since 9/11 on September 24th with the German election. Stocks are wounded and need some time to heal, but more new highs are in store later this year and into 2018. If you are nimble enough, selling short-term strength is the right strategy until proven otherwise. As hard as it may be, investors would be best served by not being glued to the news channels 24/7. Focus on the long-term. The economy’s growth is accelerating. More jobs are being created. Record earnings. Heed my theme of 2017. Reality over rhetoric! Economy Good. Markets Less So. On Friday, the Department of Labor reported that the economy created 209,000 new jobs, which was 26,000 better than expected. The unemployment rate fell to 4.3%, the lowest level in 16 years. This is just another statistic that supports my thesis that economy is in better shape than the masses realize. You wouldn’t conclude this if you spent your day watching TV. Reality over rhetoric. I don’t care if this is coincidental, Trump’s doing or lack of doing or Congress. It’s irrelevant who deserves the credit. And if you don’t like pouring over economic reports, just look at the stock market for a report on the economy. While imperfect, it does a great job at leading the economy. The problem is that the market sometimes gives warnings which don’t lead to recession. The old joke is that the stock market has predicted 7 of the last 4 recessions. However, it doesn’t miss recessions. 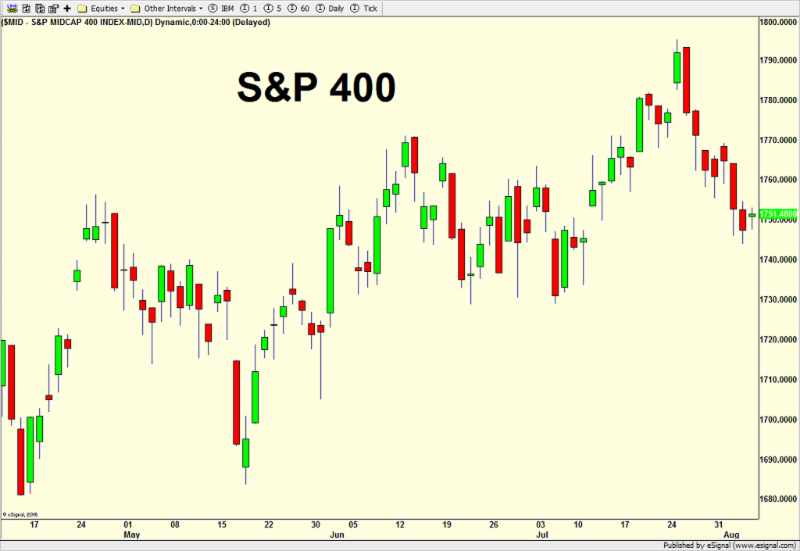 Turning to the markets, while the Dow continues to make new high after new high and the S&P 500 is close to a fresh high, the mid and small caps are several percent below their highs with the NASDAQ 100 somewhere in between. Sentiment is a bit on the excited side, especially with the media and pundits celebrating Dow 22,000. Semis and transports are lagging. 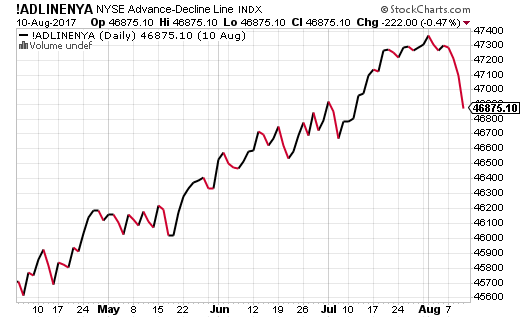 However, high yield bonds and the NYSE A/D Line are just below all-time highs and behaving very well. Again, I am not looking for anything more than a 3-5% bout of weakness during a seasonally weak time of year although with stocks so close to their highs, the negative seasonality should be somewhat muted. I don’t think this is the time commit fresh money.